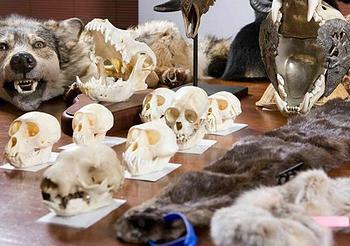 SYDNEY, Australia, May 4, 2014 (ENS) – An Australian school teacher convicted of possessing a record number of wildlife body parts, including the skulls of bears, orangutans and tigers, was sentenced Friday to 12 months’ imprisonment, but he will be allowed to remain at large in the community. John Kolettas, 44, pleaded guilty in April 2013 to 24 charges of possessing illegal wildlife products found during a search of his west Sydney home. The haul is the largest recorded in the history of Australia’s federal Environment Department; 78 items were seized, 24 of them from threatened species. Investigators found 11 orangutan skulls and 25 other skulls of monkeys, lynx, bears and a tiger. Other illegal items included teeth and skins from species such as orangutans, lynx, otters, and a feather headdress made from a bird of paradise. Items seized in this case were listed under the Convention on International Trade in Endangered Species. Australia is one of 178 countries that are signatories to this treaty. Under Australian law, it is illegal to import these animals, or their parts, without a permit. It is also an offense to possess items that have been illegally imported by someone else. The maximum penalty for these offenses is imprisonment for 10 years. On Friday, the Parramatta Local Court handed Kolettas a 12 month sentence, but ruled that it be served by way of “intensive correction order,” a form of punishment under which convicts serve their time in the community under the supervision of Corrective Services New South Wales rather than in full-time custody in a correctional center. Kolettas also will be required to undertake 384 hours of community service over the next 12 months and comply with other strict conditions. In addition, he was fined A$4,000 under New South Wales legislation for firearms violations that were uncovered as part of the Department of the Environment’s search warrant action. The International Fund for Animal Welfare said Kolettas should have gone to jail for his crimes. “This was a very serious case, the guilty man had knowingly broken the law over a number of years, even requesting that endangered animals be killed and their body parts sent to him. He deserved to go to prison,” Isabel McCrea, IFAW Oceania regional director told “The Guardian” newspaper. Kolettas’ home was targeted as part of Operation Bonaparte, an extensive investigation led by the Department of Environment and carried out with the cooperation of the Australian Customs and Border Protection Service, the Department of Agriculture, Fisheries and Forestry, the New South Wales Office of the Environment and Heritage, the NSW Police and the RSPCA. “Wildlife trafficking is a cruel and often barbaric trade that has become more widespread and lucrative and is now valued at billions of dollars worldwide,” the Environment Department said in a statement. “The illegal trade in wildlife is also driving the decline of many species around the world. The community – particularly collectors, travellers and online shoppers – should be aware of what they are buying, what it is made of, and where it is from. Without realizing it they may be contributing to the decline of threatened species, simply by purchasing what initially looks like a bargain,” the department said.